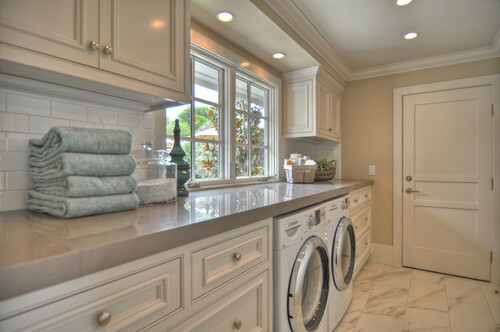 The Granite Gurus: FAQ Friday: Granite Countertop Over a Washer & Dryer in the Laundry? 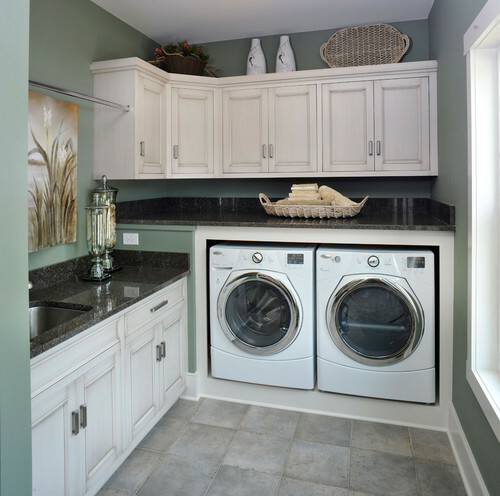 FAQ Friday: Granite Countertop Over a Washer & Dryer in the Laundry? "I'm an avid reader of your blog and with all of your design ideas that you post I now want to re-do my whole house! 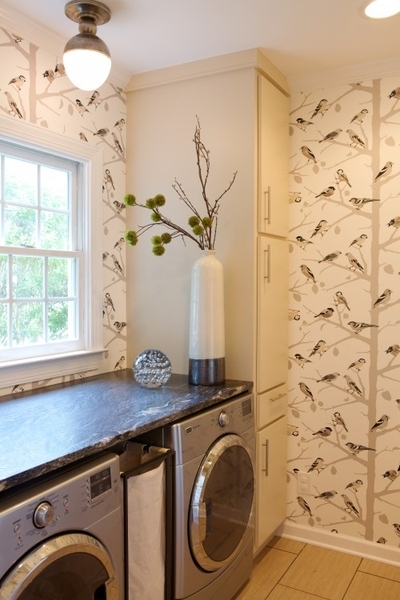 :) I am just about to start redecorating my laundry room though. I have a front loading washer and dryer and I think it's such a waste of space to not have anything on top of them. I'd like to put a granite or marble slab countertop across the top of them to give me some counter space in there, I currently don't have any. My question is, is this possible? What do you use to support the countertop? Thanks in advance for your help!" Thanks for the question Angie. 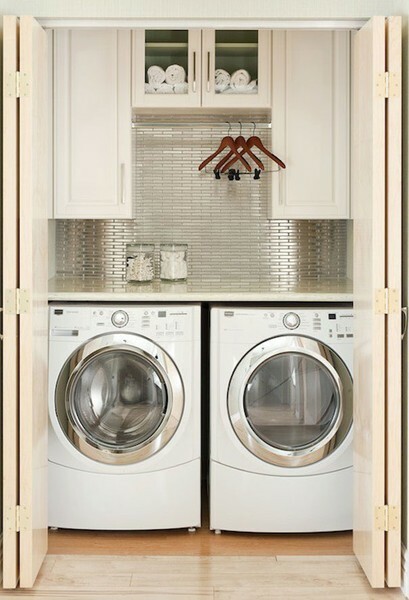 Yes, it's a great idea to put a countertop over your front loading washer & dryer! Not only is it beautiful, it's very functional. The extra counter space is nice, plus it helps prevent all that lint and garbage from accumulating in between them. There are a few different way these can be built. Some people do have cabinets and then just run the countertop straight across the cabinets and the washer & dryer. Most commonly, a contractor will build support on the wall and then we usually integrate a steel bar into the stone for extra support. I also like the idea in the photo above where they added a set of drawers between the machines. I'm assuming they have supports on the back wall as well. Another way to build these is to build a box out of wood (you'll notice a couple of the pictures below have done this) and then top the wood with your stone countertop. 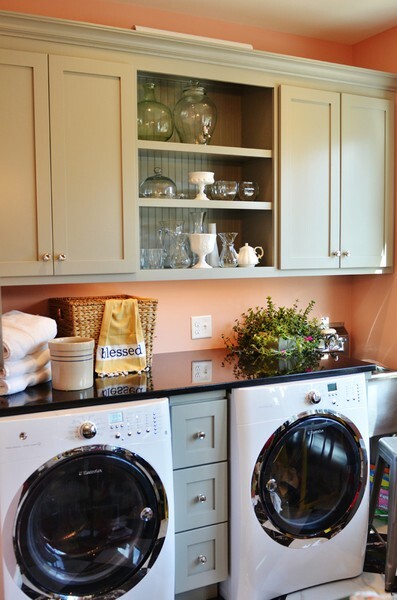 Be sure to give your washer and dryer plenty of room away from the countertop. Those front loaders can move and shake a lot when in use and you don't want them continually hitting your stone countertop. This also means do not put the stone countertop directly on the washer and dryer. Thanks again for the question Angie. 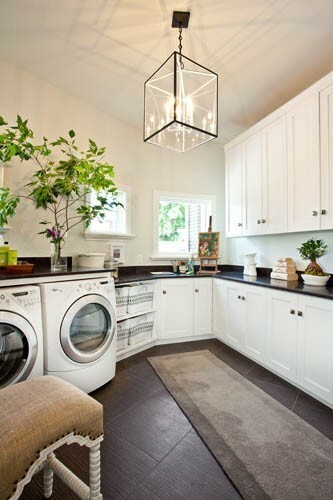 Hopefully these photos inspire your laundry renovation! If you have a question you'd like to see answered here send me an email. Great post! I would also like to suggest that if you're installing upper cabinets over your washer/dryer to make them deeper than 12". The counter will usually be way deeper than the usual 25" so if you want to reach into those uppers you have to pull them forward, especially if you're short like me. Thanks Gloria, and thanks for the advice. 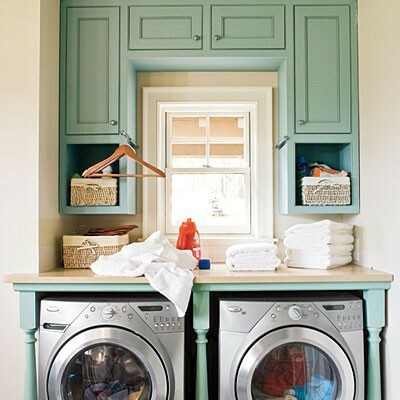 I see upper cabinets that are way too shallow over the washer and dryer all the time. Great tip!